Da Capo Lifelong Books, 9780738219653, 208pp. William Bridges, PhD, was an internationally known speaker, consultant, and author, and a preeminent authority on change. For decades, he showed thousands of individuals and hundreds of organizations how to deal more productively with transitions. Susan Bridges, president of William Bridges Associates, consults with leaders and organizations facing unprecedented change. She provides insight and tools to capitalize on the potential for development and innovation during transition. She lives in Marin County, California. Managing Transitions was timely when it first appeared twenty-five years ago. It is even more relevant now, at a time of unprecedented change and transition. The Bridges' deep understanding of how we experience the destabilizing forces of change--and their well-tested strategies for helping people through it--are more important than ever. A very wise book by a very wise man. This new edition is a celebration of William Bridges' original insights and practical guidance. With incisive contemporary cases and immediately useful applications, Susan Bridges masterfully reintroduces his exceptional work to a new generation. Pick up any business book today and you will find words about unending change. What better guide for this unrelenting change than someone who has spent decades studying and reporting on how to survive it? If you need that guide--grab this book! William and Susan Bridges provide a road map to get through the most difficult work and life passages. This richly updated new edition of the insightful Managing Transitions, filled with fresh and compelling examples, will be indispensable for leaders trying to guide their organizations through a period of unsettling change by managing the pain and uncertainty of the neutral zone. A timely update to a timeless book. Managing change is a way of life in today's organizations, yet too often it's handled poorly. That's why Managing Transitions has become the essential guide on how to do it right. This new, revised edition deftly guides the reader through the organizational change process from start to finish, offering practical advice grounded in the authors' vast experience working with every size and type of organization. This book is must reading for every leader, manager, and employee undergoing a change process. Come to think of it, doesn't that include just about everyone? The most important idea I have encountered about organizational change is this: great change requires human transition. Decades of experience have proven that no magic set of steps, no financial incentive, no clever argument, and no threat can guarantee that a workforce will embrace change. People need real help in psychologically transitioning to a new situation--and that help is available here. 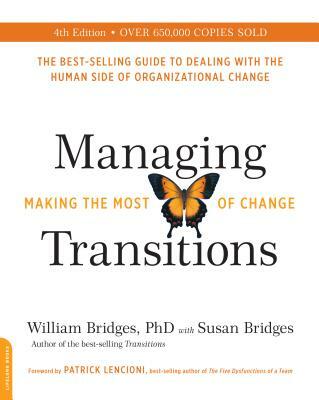 In this fourth edition of Managing Transitions, William and Susan Bridges further expand their proven approach for helping people and organizations embrace real change. Managing Transitions is an essential guide for leaders and Chief People Officers who are navigating transitions and change within any organization. It is also a handbook in life for dealing with endings, new beginnings, and the disruptive 'neutral zone' in between. This book provides a pathway to human and authentic leadership and a way to gracefully navigate through the changes we all face in life. —Gabrielle Toledano, EVP and chief talent officer, Electronic Arts, Inc.
Susan Bridges has done something generous, courageous, and brilliant with her updating of this classic and treasured book by Bill Bridges. In a collaborative process with the ideas of her late husband and business partner, she has made the language, concepts, and examples fresh again and available to a new audience. Bill's ideas have been fundamental to my own practice, and now they will inspire a new generation of leaders and change-makers to be wise, humane, and strategic, as they move their complex organizations through and increasingly challenging set of realities. Change is constant in today's global business environment, and yet change management continues to be a challenge for most organizations. That's why Managing Transitions remains an important book; it identifies the critically important role that understanding the human size of transition plays in effective change management. This updated edition is a must-read for anyone who wants to lead change successfully. "This book includes thought-provoking quizzes." "Provid[es] an elegantly simple yet profoundly insightful roadmap of the transition process."